TELUS Mobility, Canada’s 2nd largest mobile phone carrier has promised Canadians, “The future is friendly.” But this isn't exactly how their customers would describe their customer experience. TELUS knew their customers expected a better online experience. With the ever-growing mobile market, TELUS customers want to be able to access their account information on any device, easily, no matter where they are. 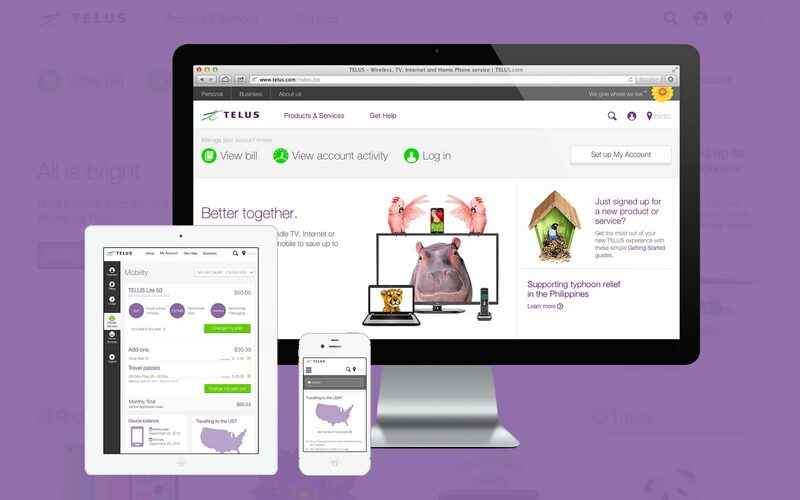 We partnered with TELUS to redesign how they serve their customers online. 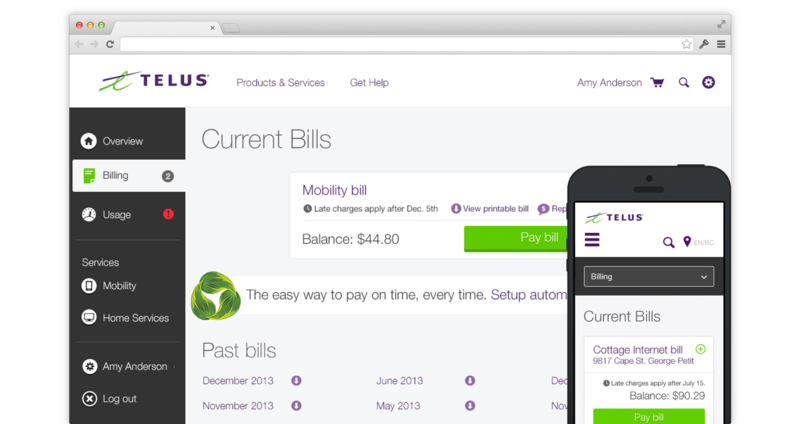 After conducting research with TELUS customers, we learned that customers primarily use the My Account app to check their mobility usage and pay their phone bills online. We worked in-house with TELUS, as embedded designers, to create cross-disciplinary teams to them help rethink their self-serve experience for their customers. As a result, there was a massive improvement to overall customer satisfaction, and a great reduction in the frequency of Customer Support calls because their customers were given the power to manage their account and understand their mobile services without unnecessary complexity. Know exactly how much of your plan you've used in real-time. When customers get close to their plan limits, they are notified to help avoid additional charges - No more surprises when their bills are due. No more technical jargon. 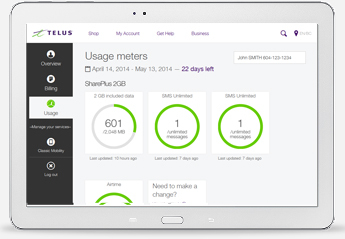 Customers can easily understand key information about their TELUS services and conveniently pay their monthly bills online. 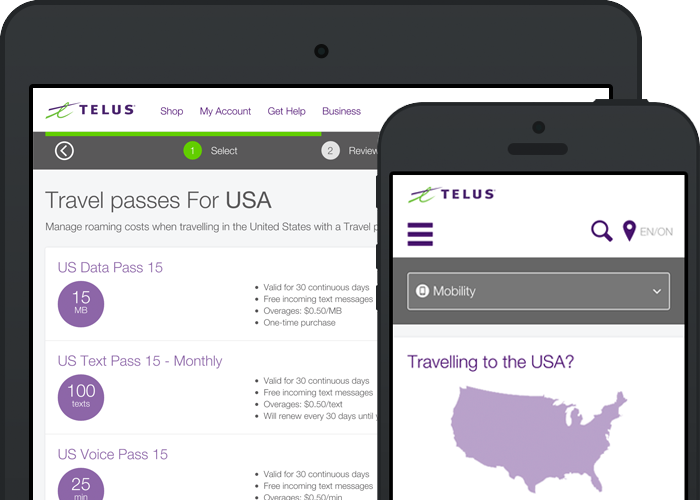 Building a fully-responsive web application allows customers to easily manage their TELUS services on a desktop, smartphone or tablet device, no matter where they are. Save money on roaming charges by picking a travel pass and adding it to your plan. Even if customers forget to buy one before their trip, they can easily add it to their plan when you arrive at their destination.